Hmmm . . . I guess the acronym for the title of this post is CRAP. Oh well, that is not important. I was thinking about the eventuality of me not being here for the Damsel or vice versa. We each have our own IRAs and have each other as beneficiaries. 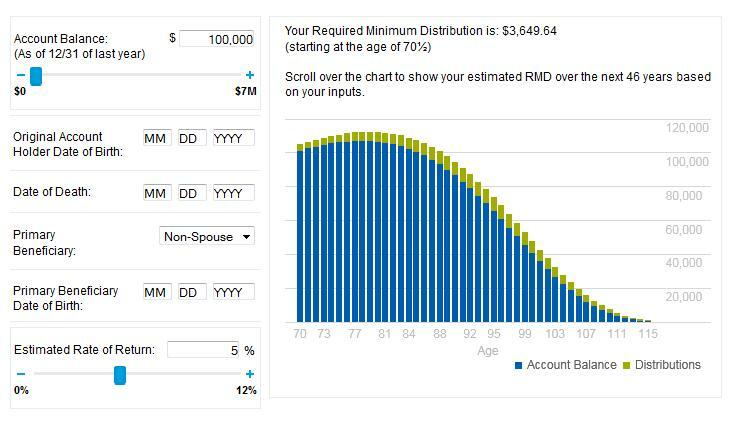 I wanted to see what would happen to my Required Minimum Distribution (RMD) amount should I not be here or what the withdrawal implications of hers would be if she were to be gone. Hard stuff to think about but it’s gotta be done. I looked around on the (insert famous savings institution here) website and did not find much information on my specific concerns. Next, I used an on-line search engine with appropriate keywords and found several links. One link to the Charles Schwab IRA Calculator proved to be the exact information I needed to know since it was specific to the beneficiary of an inherited IRA. I needed to enter several relevant items: the balance of the account as of 12/31/14, date of birth, date of death, type of inheritance (spouse), beneficiary’s date of birth and an estimated annual rate of return. The calculator itself updates immediately with each new entry. I actually like this calculator better than the one found on my IRA holder website. The answer to my original question of “what happens if . . . ?” is - nothing! When I go, she inherits the IRA just as it is and will continue to have the required minimum distributions just as it does today. If I should inherit her IRA, RMDs won’t be necessary until the year where she would have turned 70½ and the distributions would be based on her date of birth, not mine. The IRA distribution scenarios are identical whether we’re here or not.